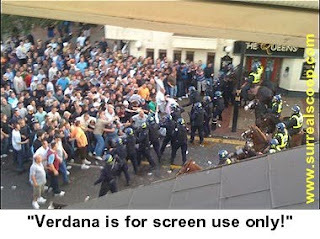 Residents of affluent suburbs the world over were today warned to stay in their homes as middle class areas were consumed by another day of rioting following the news that Ikea had changed its catalogue typeface from Futura to Verdana. The same story was repeated the world over. In the Mission area of San Francisco the early morning sun rising across the bay shone on rows of burnt out cars and overturned buses. In a bid to bring order to a world ripped apart as another pillar of middle-class society undergoes the inevitable pressure of change, an online petition has been created to allow people to anonymously assert their right to have no absolutely effect on a huge international corporation and its typeface. Verdana is a font designed and optimised for display on satirical websites that are only occasionally updated. Ikea is said to be leading the world in using such a font in print but the chaos brought about by the change has forced politicians at the highest level to wade into the debate. And MEPs.